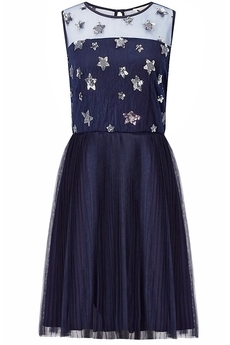 Yumi London Sequin Star Tulle dress is the perfect dress for parties during the festive season. Falling above the knee, the sleeveless design is adorned with silver sequin embroidered stars, fitted waist, knife-pleated full skirt and button fastenings down the back. Has concealed back zip fastening, it is fully lined and is approx. 95cm in length. Composition: 100% Polyester. Color: Dark navy.